We have the wedding car for you, from Bentley to VW camper, Cadillac, Vintage Chrysler and Daimlers too, or check out the Oldsmobile for something new! 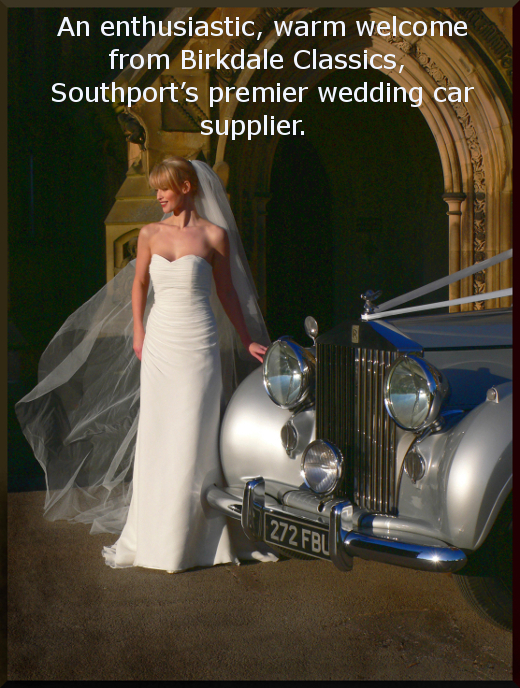 Southport's longest established wedding car provider, Unique and rare cars for your Merseyside or Lancashire wedding. Over 26 years, we have carefully chosen a range of the best and most dramatic wedding cars available. Transport yourselves to another era in one of Birkdale Classics' vintage and classic wedding cars, based in Birkdale, Southport. If you are looking for something different then we are the people. We have the largest, most diverse and rare collection of cars for hire. We also provide transport for charity functions and events and for display purposes. Film work, videos, promotional events are all part of the service. Check Facebook for the latest. "Life is too short to settle for second best which is why we only supply genuine vintage and classic cars." Have you seen our latest? Check out the Oldsmobile for your man!